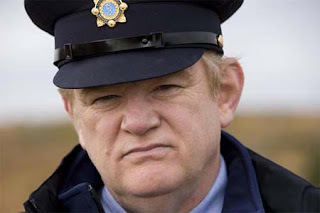 Much like his older brother Martin’s In Bruges, John Michael McDonagh’s The Guard aims to drop jaws with hilariously un-PC antics, while allowing itself to have a genuine backbone. The salty and the sweet, laced with a touch of acid. The Guard tells the story of Sergeant Gerry Boyle, a carefree, rule-bending Irish policeman who unexpectedly becomes partnered with Wendell, a by-the-book FBI agent investigating a massive drug smuggling ring that may or may not be passing through Gerry’s small Irish town. But plot, as casually observed in In Bruges, isn’t the McDonaghs' primary interest. They thrive on situational dialogue and graphic violence that is often made humorous. Witnessing the blasé reaction of a character’s death in The Guard (“Nice shot,” he murmurs as he falls dead) is nearly as funny as John Travolta’s reaction upon shooting Marvin in the face. In short, The Guard is a damn funny film, ranking with Bridesmaids and The Trip as the most hilarious film of the year. From The Guard’s opening scene, which includes loud rap music, bottles of Jameson, acid tablets and bloodied bodies, you know you’re in for a witty, demented treat. Gleeson has successfully managed to tap two markets, the Hollywood blockbuster (he’s had memorable roles in Braveheart, Gangs of New York, Troy, and a few Harry Potter films), and the credible indie scene (28 Days Later, Dark Blue, Harrison’s Flowers). And while I thought his acting reached a welcomed new high with In Bruges, it’s hard to top his performance in The Guard. Expect to hear (and hopefully see) some awards consideration. Now, while The Guard is littered with amusing interludes of witty dialogue, the movie is not without its faults. For one, Don Cheadle’s Tennessee accent tends to noticeably dip in and out during long monologues (in fact, his Southern heritage lends nothing significant to the character; Cheadle could’ve easily kept his own voice). Secondly, the film has a slight tendency to linger and drag, which at 96 minutes long, isn’t really a good thing. For The Guard showtimes, click here. This is one of my favorite films to come out this year. "Are you going to keep making a series of declarative statements or are you going to ask me a question?" priceless dialouge in this flick. We seem to have very similar tastes. I too, liked this film a lot. I would say it is the funniest film of the year (along with The Trip) and Gleeson, who is usually excellent anyway, gives an awards-worthy performance. The weakness was definitely Cheadle's character, whenever he was given his own time. Totally agree. It reminded me so much of In Bruges. What an underrated flick that was. In Bruges was one of the best films of 2008, for sure.